If it isn’t about yarn, it must be food related. Looks like I’m not going to make it into BlogHer food. I signed up late and was on the waiting list – foolish to wait I know. 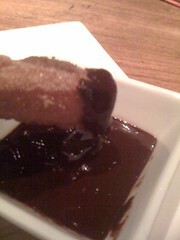 I’ll just drown my sorrows in Monkey Love and Churros dipped in chocolate. 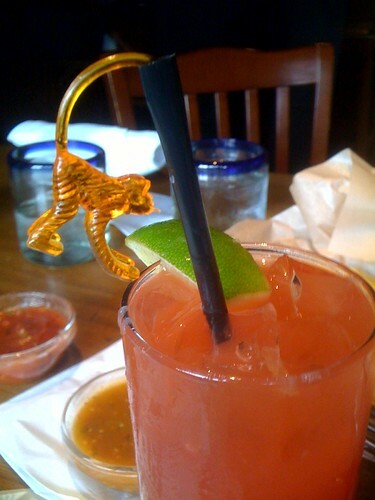 Monkey Love is the drink above as served to me at Marinitas, a new restaurant in San Anselmo. I might have to reverse engineer it for consumption at a later date. I know it contained Myer’s platinum and dark rum, pineapple, orange and hibiscus. Very tropical and very potent. The rest of the meal was pretty darn tasty too. We shared appetizers: ceviche, and queso fundito (mmmmmm queso). And I had the Saturday special entre Pork Tinga. The pork was fork tender and served over cheezy polenta (mmmm cheezy). My only complaint was that we had to order tortillas separately. Who serves a plate of meat without tortillas? Oh man that churro looks fantastic! 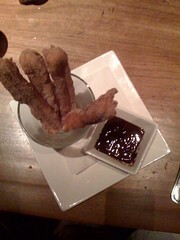 A well-fried churro with thick chocolate to dip into will make any day so much better. I think we should all eat them daily. Hah. If only we could! Previous Previous post: Two of my favorite things – Legos and Yarn!